Isabella Price is an example of one of the many Christian women whose contribution to NSW society and to the ministry of the Christian Church has gone unrecorded and unacknowledged. Her work was largely unrecognised in her own day and what recognition was given to her area of service was overshadowed by others. Isabella Price was the matron of the Goodlet Consumptive Home from its opening in September 1877 until July 1894. This Home was a private charity set up, funded and run by the Scottish born Sydney merchant, manufacturer, philanthropist and churchman John Hay Goodlet. John and Ann Goodlet began the Home in a leased former hotel at Picton in September of 1877 and it could cater for 18 patients. Both males and females were admitted and the only requirement for admission was that the persons were poor and consumptive. 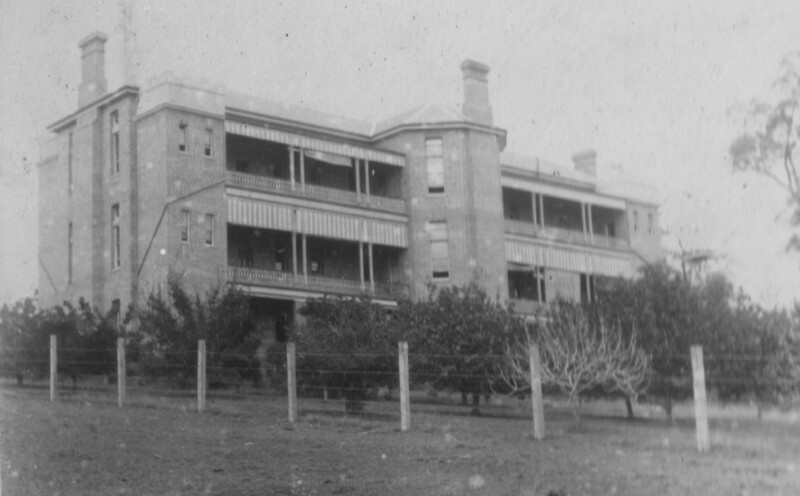 Such was the demand for places in the Goodlet Home that in 1884 the Goodlets began to plan a purpose built facility at Thirlmere which could cater for 40 patients again at no cost to those admitted. It was opened in September 1886. The construction cost of the home was fully met by the generosity of the Goodlets. They did not spare any expenditure on either the construction of the Home or in its recurrent costs and they even paid for the burials of the many who died there. In the period 1877 to 1893 when the Goodlets ran the hospital some 940 patients were admitted with 233 patients dying within the facility. It was of this facility that Isabella Price was the matron. Little is known of Isabella Price other than that her work was highly esteemed by the Goodlets and the patients. Isabella was born in 1831 in Barrackpore, Calcutta India to Andrew and Elizabeth Marr (nee Peters). Her father was the Park Superintendent at Barrackpore and died before she was one and her mother died when she was seven. Her mother must have had a difficult life, being first married in 1821 (Daniel Desmond) and again in 1824 (George Dougherty) and then to Isabella’s father in 1825. On the death of Andrew Marr in 1831 she then married again in 1832 (John Gash) and she herself died in 1838. When Isabella was 14 she and her step sister were orphaned through her step father’s death in 1844. It is unknown what happen to Isabella but her step sister was consigned to the European Female Orphans Asylum where she died two years later. Thus at the age of 16 Isabella was left with no family. Misses Toogood and Marr are held in loving remembrance by those who knew them, and their names should have a place in any history of the Zanana Mission. ….. Miss Marr, like Miss Toogood, was remarkably well qualified for such a service, pious, prudent, courteous, loving. Their enthusiasm about their zananas was beautiful. During the Sepoy Mutiny of 1857-1858 Isabella was shut up in the Agra fort with many Europeans. It was during this time that she probably met and then later married John Christopher Price. It would appear that she, after her husband’s death in Calcutta, travelled to Queensland in the early 1870’s and, came to NSW around 1877. It is at this time that she was employed by the Goodlets to look after the residents of their home. She served in the home as Matron from 1877 until 1894 and was dedicated to looking after the residents. Her task was not merely that of management and nursing but the Goodlet’s intended her to have a spiritual ministry. The advertisement that she answered placed by the Goodlets, unlike other advertisements for positions at the Hospital required her to be a member of an ‘evangelical church’. seems to be regarded as one of those ministering angels whose function is to relieve by their presence, and their goodness of heart, the pain and anguish which wring the brow of the sick and the unfortunate. She is up at all hours of the night, and sometimes all night, watching beside the bedside of a man or woman over whom death is fast obtaining its inexorable mastery. In 1893 the Goodlets, due to the economic depression of the 1890’s were no longer able to maintain the Home and it became a public charity. Isabella remained at the Home for one year after the Goodlets relinquished control. She then went and lived with them at Canterbury House in 1894 where she most probably nursed Mrs Goodlet whose health had begun the decline which led to her death in 1903. Such was Goodlet’s regard for Isabella that she remained at Canterbury House even after Goodlet remarried in 1904 whereas at this time other long time co-residents, such as the Rev Joseph Copeland and family, left. Isabella remained at Canterbury House until John Goodlet’s death in 1914. That she went to live with the Goodlets, and did so for so long, tells us how much her service was valued by the Goodlets and that they felt a responsibility towards this widow who had served their charity so well. After John died she took up residence in Ashfield and she herself died in 1920 and was buried in an unmarked grave in Rookwood cemetery. At the death of both Ann and John Goodlet rightly much was made of their dedication to the cause of the poor consumptive. At Isabella’s death there appears to have been no public recognition of her contribution to the welfare of the poor consumptives of the colony. Her contribution, though unnoted and subsequently forgotten, was considerable. Her stepfather probably died in Minapore 9 May 1844. It opened on 23 February 1852 (sometimes recorded as 1 March 1852) under the supervision of the Suter sisters. Missionary Register Vol 41 ,127. H. Lloyd Hindu Women (London: Nisbet, 1882) 55. Isabella Marr was a graduate of the CNS and not a teacher and this is consistent with her perhaps being Eurasian however her step sister clearly was not as she died in the European Female Orphanage which required both parents of orphans to be European “Rules of the European Orphan Asylum” 1.2 in C. Lushington The History Design and Present State of the Religious , Benevolent and Charitable Institutions bound by the British in Calcutta (Calcutta, Hindostanee Press, 1824) lxxvii . While it is possible Isabella was Eurasian it is on balance more likely she was European. Henry Verner Hampton Biographic Studies in Modern Indian Education ( Books for Libraries Press, Freeport, NY 1970) p117; Geoffrey A. Oddie Imagined Hinduism: British Protestant missionary constructions of Hinduism 1793-1900 (Sage, New Delhi, 2006) 293. These works designate Miss Toogood as a Eurasian but when Dr Duff reported on her employment to teach in a high caste girls school in order to counter native prejudice against a native teacher she is designated a European. Proceedings and Debates in General Assembly Free Church of Scotland, 1860 (Edinburgh:Nicol, 1860) 18. G. Smith The Life of Dr Alexander Duff 361 describes her as ‘a European governess who knew Bengalee perfectly’. As Miss Toogood was a teacher at the CNS it is more likely she was European. These accounts being closer to the event and the circumstances surrounding Miss Toogood’s appointment to the Duff School favour his designation of her racial background. Isabella Marr was a graduate of the CNS and not a teacher and this is consistent with her perhaps being Eurasian, however, her step sister clearly was not as she died in the European Female Orphanage which required both parents of orphans to be European. George Smith Twelve Pioneer Missionaries (Thomas Nelson, 1900) 83. It is unknown when Isabella’s husband died. It would appear from her death notice that he died in Calcutta. SMH, July 27,1920. See SMH, June 13, 1878 for a comparison. Isabella Price of 3 Central Road died in Ashfield in 26 July 1920. Her death was reported by a non relative AE Seward who was probably Annie Eliza Seward daughter of William and Ann Seward friends of the Goodlets. SMH, 27 July 1920.